Such a fun idea for a quick and easy treat! Spray counter lightly with non stick cooking spray. Combine rolls and roll into a 12-inch circle. Place on a sprayed 12-inch pizza pan. Brush dough with melted butter. Combine sugar and cinnamon and sprinkle over the butter. Combine dry topping ingredients well and cut in butter until crumbly. Sprinkle topping over pizza. Cover with plastic wrap and let rise 30 minutes. Remove wrap and bake at 450 degrees F 8-10 minutes. 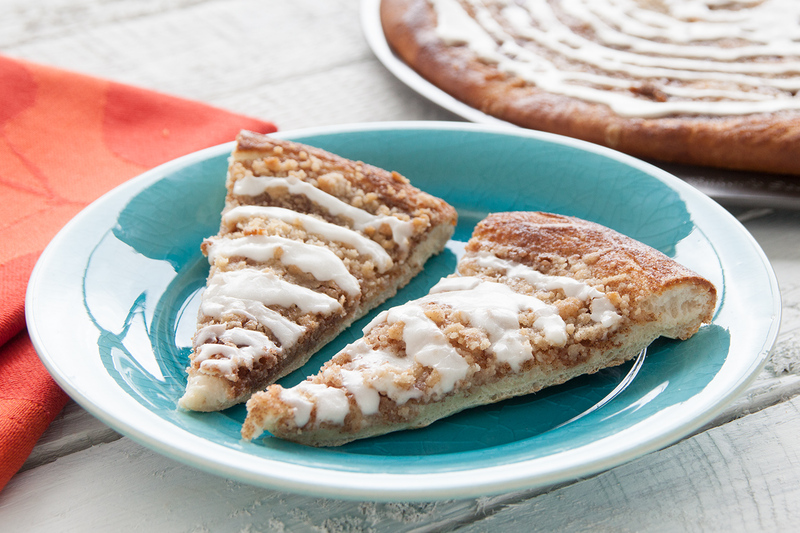 Prepare glaze while pizza is baking by combining glaze ingredients. Remove pizza from oven and let cool a few minutes. Drizzle with glaze and serve warm.